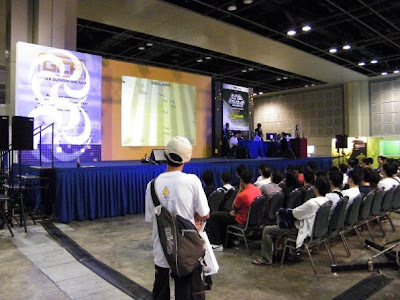 Competition area for the One Asia Cup Final for EA SPORTS FIFA Online 2 platform , inside the event hall of the GCA 2009. 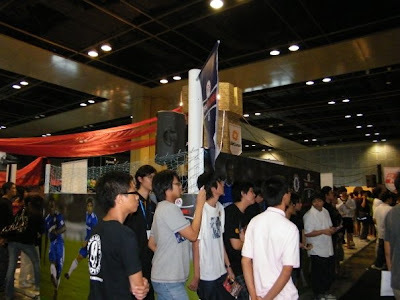 Some of you may think how would a football blogger like me be covering a game event (Games Convention Asia) at Suntec City? 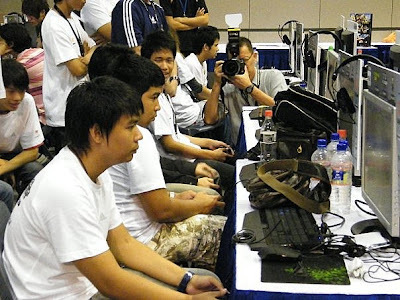 In the past, the idea of earning a livelihood from playing computer game would be deemed IMPOSSIBLE and being ridiculed upon. 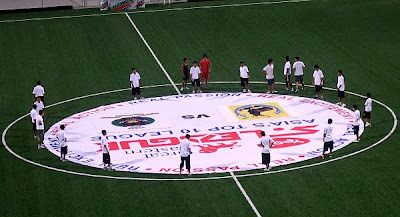 Participants from other South-Asian countries completing against one another for the US$100,000 worth of cash and prizes. 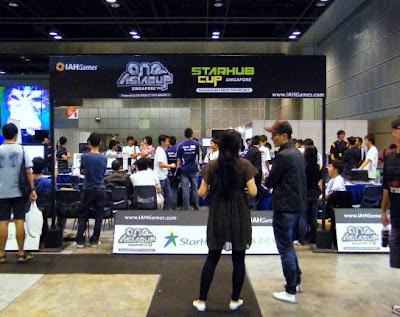 But as the gaming industry gaining bigger market share, it's inevitable that some game makers, in order to gain larger market share, start organize tournaments with cash prize monies to entice budding gamers to pit against each other (which some top gamers eventually making a living on those winnings plus endorsement deals). Perhaps from those passions and determination shown by those gamers can teach a thing or two to those existing footballers waiting at the bay to fill up that vacuum created by the mass exodus of national players to Indonesia. It sounds like I'm trying to use the two totally different things to draw an analogy with each other, but if we take a closer look at how things been evolved for the gaming from those dark alley days to a million-dollar industry, I would have to say the local football scene is at its "dark alley" days NOW. This is a conclusion drawn from many discussions I had in recent days with many of my peers and like-minded local football supporters after the recent "walk-out" of some national team players to the Indonesian League. Baihakki Khaizan (top) is set to left for Persija in Indonesia. Maybe, the league authority still stuck to its guns that by prided itself being "one of the Asia's top TEN leagues", however, the resentment of the lack of progress and remedy in certain issues highlighted by Noh Alam Shah, prior to his departure to Arema Malang, had somehow opened a can of worms that every single area of the league setup is being scrutinized avidly. Is the tag of "Asia's TOP 10 League" too much a burden for all? I think it's really time for all of us to STOP finger-pointing each other and seeking a resounding solution to each problem the league is facing now is the utmost task for all. It would be more productive in this way, isn't it? Rather than wondering if the youngsters we have in the Prime League are ready/able to fill the gap (even if Alam Shah doubt them with all due respect to them), when now there's a chance to do so. In case, you're not aware of it most Prime League games play at 5 pm on weekends, call the clubs for details and catch them in action to judge for yourself. Rather than approach that "wait-and-see" attitude most clubs having now, to see how we can really take care of the players' welfare and their well-being after they hang up their boots. 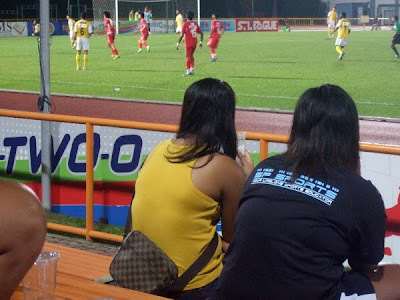 Point to ponder: How are we gonna package the league to attract more ladies to the game? 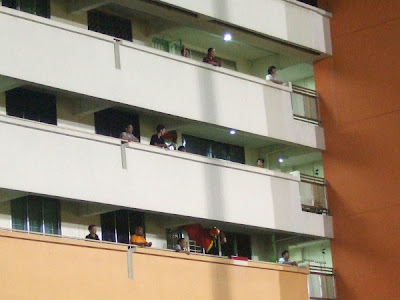 Rather than complaining the lack of atmosphere at the stadiums, when one got to ask themselves WHEN WAS THE LAST TIME they saw a live game (I mean at the stadium and NOT from your living room) and guilty enough to admit on pointing out every shortcoming they perceived based on limited information and fact, while not making an effort to go down to their neighbourhood stadium all because "lack of time"? Are you are of them, deprived the clubs from taking more gate-taking? Rather come up with some initiatives that are being "taken-for-granted" for all would accept them, it's time to have a conducive feedback channel to hear from all stakeholders what they want. It's going to be a long and tough process to win back the lost fans, whom many of them still living in those Malaysia Cup days, to the stadiums, nevertheless, waiting for solution to drop from the sky is not an option. So at end of the day, if those gamers did not stick their gun and hang to it, I think it would still stuck in their "dark-alley" days, isn't it? It's high time we cracked the whip and start walloping the horse... CHARGE!